Superman is perhaps the longest-lived of the classic Golden Age superhero characters to remain in the public imagination, and, in addition to a 75-year history of comic book publication, the character has also had a long career on the silver screen. Unlike many other superheroes, Superman has an extensive history of being utilized as a film character, and his film appearances have influenced his portrayal in comic books in many fascinating ways. Created by Jerry Siegel and Joe Shuster, Superman first appeared in Action Comics #1 in June 1938. A mere three years later, Superman made his first onscreen appearance in the Fleischer Studios’ animated short film, Superman (aka “The Mad Scientist”). In addition to being an enjoyable, well-made film, this cartoon marked a major point in the character evolution of Superman. Prior to this, Superman did not have the power of flight - he was only “able to leap tall buildings in a single bound,” similar to the high jumping ability of earlier pulp hero John Carter. Animators at Fleischer Studios decided that repeatedly animating high jumps made the Superman character look comedic, so they went for a more dramatic style of flight. Watching Superman fly into battle became so popular among his fans that this ability was quickly incorporated into the comics. Classics such as “The Mechanical Monsters” and “The Magnetic Telescope” provide a good look back at how the early Golden Age Superman adventures were written. Storylines were contained within a single episode, unlike today’s modern comics which follow expansive story arcs that can last for months. Superman did not have much of a rogues’ gallery in his early days and was pitted against mad scientists and criminal stock characters. Superman’s origin as “The Last Son of Krypton” was already firmly in place, but there is very little in the way of explanation of what Krypton was like before its destruction. Most of Superman’s world, such as his Fortress of Solitude and his most infamous nemesis, Lex Luthor, was yet to be invented. Throughout the 1950s and 1960s, the “Silver Age” of comics occurred, and Superman’s world and backstory were significantly expanded. Superman’s most infamous villains debuted during this period, including Lex Luthor and General Zod, and the alien aspect of his origin was further developed, with Krypton receiving a greater level of analysis from comic book writers. However, Superman’s deepening characterization in comics occurred during a sea change in animation, as the detailed animation for theatrical cartoons was replaced by sparse, made-for-TV “limited animation.” It would take decades for another animated series to do Superman justice. The most popular portrayal of Superman during this period was the long-running live-action Adventures of Superman TV series, in which George Reeves starred as Superman. Unlike the Fleischer shorts, which emphasized action and motion, the Superman TV series emphasized character-driven drama and Superman’s career at the Daily Planet as Clark Kent. Only in 1978 would Superman finally get a chance to soar on the big screen again. “You will believe a man can fly.” The posters of the 1978 film Superman had one of the most memorable tag lines in history. With its high production budget, strong performances, and exciting action sequences, Superman did justice to the character’s legendary Silver Age run. Even as it paid homage to Superman’s portrayal in the comics of the 1950s and 1960s, Superman continued to alter the mythos of the character in interesting ways. Perhaps the most influential of these was its portrayal of Krypton. Previously characterized simply as a world whose inhabitants had evolved beyond humanity, Superman gave the Kryptonian civilization a negative, dystopic portrayal. Kryptonians were portrayed as emotionally cold and arrogant, and the world of Krypton was given an icy, crystalline production design. The sequel, Superman II, was released in 1980. This film contained some of actor Christopher Reeve’s finest work as Superman as he tries to balance his human existence with Clark Kent (and romance with Lois Lane) with his duties as Superman, as the world is invaded by three Kryptonian criminals led by the villainous General Zod. Superman II was more than just an action movie and featured a memorable segment where Superman uses technology from the Fortress of Solitude to remove his superpowers and try to lead a human life. Watched together, the two Superman movies offer a compelling portrait of the Superman character. Sadly, later entries in the Christopher Reeve series did not live up to the quality of the first two. Superman III did not feature a number of important characters from the first two installments. Both Gene Hackman as Lex Luthor and Margot Kidder as Lois Lane were absent from this film. The actual script was a bizarre attempt at comedy that involved an evil computer and a special form of Kryptonite that created an evil Superman. Although the film made money, it was far less popular than its precursors, and the rights were sold to low budget action producers Cannon Films for future series installments. By the time the series’ final entry, Superman IV: The Quest for Peace, was released, the series was operating on a greatly reduced budget. The flying scenes frequently reused a shot of Superman flying directly at the camera, and the effects in this film probably wouldn’t convince a cat that “a man can fly.” Gene Hackman as Luthor and Margot Kidder as Lois Lane had finally returned to the series, but Lois only appears in the film briefly and Hackman’s campy portrayal of Luthor was looking increasingly dated as the comics’ Luthor became a more serious, menacing villain who cloaked his evil in corporate success. The film was a major financial disappointment and another nail in the coffin for Cannon Films, which would finally collapse in the early 90s. In 2006, director Brian Singer’s homage to the classic series, Superman Returns, was released. 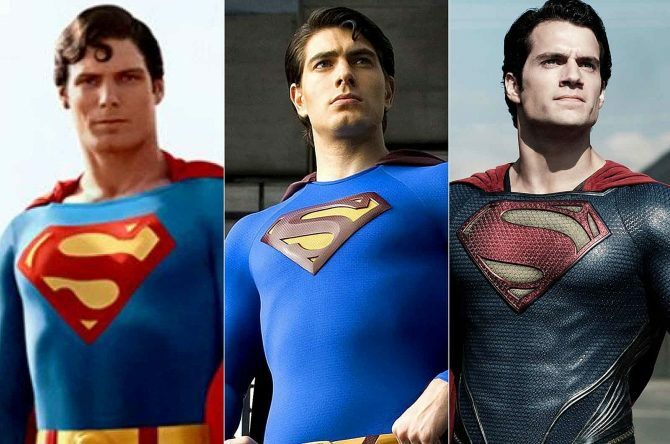 Superman Returns restored an epic sweep to the action sequences of the series, and featured solid performances by Brandon Routh as Superman and Kevin Spacey as Lex Luthor, but struggled with a strangely “neither fish nor fowl” status as it tried to straddle the distance between the modern Superman comics and Donner’s Silver Age vision. Spacey’s Luthor was allowed to be menacing, even vicious, but still had his heart set in the campy real estate schemes of Hackman’s character. A brief part of the film’s opening was spent on Lois Lane’s argument as to “why the world doesn’t need a Superman” but nothing over the rest of the film’s runtime made it seem that humanity benefitted in any way from its lack of Superman. I will always have a soft spot for this film, if only because it was the one time I heard John Williams’ iconic “Superman March” on the big screen. In the post-Nolan rush to develop DC’s superhero properties, eventually, the Superman series was rebooted once more with Henry Cavill as Superman. The first of these movies was 2013’s Man of Steel, a movie that had exciting action sequences and a great deal of modern-era style Superman action but an odd emotional coldness that lingered over it. It may have been because plot elements like the life of Clark Kent and the Daily Planet were thrown into the background, or it may have been the unusual flashback-heavy narrative structure, but Man of Steel seemed to lack the emotional core of the earlier Christopher Reeve films. The film did have a great deal of potential scope for the DC films as a series, with plot elements like an intriguingly different version of Krypton and Russell Crowe’s compelling Jor-El. That was sadly never followed up on in Cavill’s subsequent Superman films. In Batman v Superman: Dawn of Justice, Superman is reduced to a supporting character in his own universe, as the majority of the film’s runtime shifts to the quest of Ben Affleck’s Batman to find a way to murder him as retribution for the many people that died during Superman and Zod’s ending fight in the previous film, despite the fact that Superman attempted to prevent as many civilian deaths as possible. Very little actual character development is spent on Superman here; most of the movie is about Batman’s attempt to overcome him as an enemy, rather than how Superman’s years of heroics have changed him. Superman gets even less screen time in the followup, 2017’s Justice League, where he spends most of the movie dead and only really takes part in the final battle; this was a movie about introducing new characters rather than developing Superman. Clark Kent is all but forgotten during both movies (and since Superman is “dead” in between films, explaining his absence from his day job would stretch logic anyway). After Justice League, Cavill fought for a massive pay raise from the studio for continuing on in the Superman role and lost. No new Superman movies have been scheduled or announced in the scripting stage by Warner Bros., suggesting that the character, at least for the movies, is on hiatus again. You can consider reading graphic novels like Luthor and Superman/ Batman Public Enemies to look at the path that the DCEU should have taken with the character in the movies - or what they may take in the future.